I wanted to share with you all, a way to source hardware CAD files from McMaster Carr which should save you a lot of design time and make your models look great! Even if you are not interested in purchasing from them, you can at least grab the CAD files for your work and cross reference the part #'s with your favorite store. First lets start off by going to McMASTER-CARR. Once you get there, this is the main website you will see. In the top left corner of the website will be their search field, just below their logo. This is great if you know exactly what you are after. If you are unsure, use the graphical search (Product Category’s) in the main body of the website. As you click through the graphical search (Product Category’s) you will be presented with more graphics as your search becomes more defined before getting to the exact product you are after. For this tutorial, I am going to work on getting the CAD file for a Mounted Ball Bearing. Once ive found the bearing and brought up its Parts Page, this is what you’ll see. 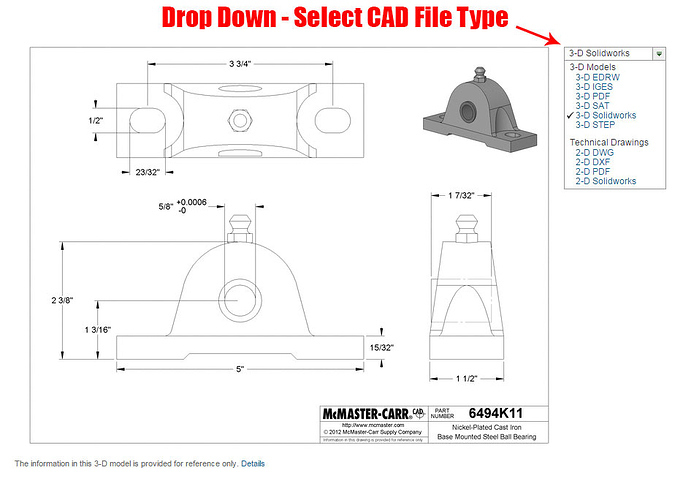 Mounted Ball Bearing - As you can see in the image above, if McMASTER CARR has actually supplied a CAD file for this part you will see the CAD indicator shown with the upper left red arrow. Also, clicking on the part number for the item you want will bring up a small detail box that also shows if there is a CAD file available. Here are the CAD file indicators again. After clicking on your part number there is a button that says, “Product Detail”. If there is CAD data available, just beside this button you will see the same small green graphic that says, “CAD”. Here is an image to represent the two indicators that CAD files are in fact available for the part you are looking at. Notice the small green CAD image as well as the line of text asking you to click on a part number if you are looking for a 3-D model and/or a part drawing. The image below shows that no CAD files are available. The red arrows are pointing to the two locations where you should see the small green CAD graphic. 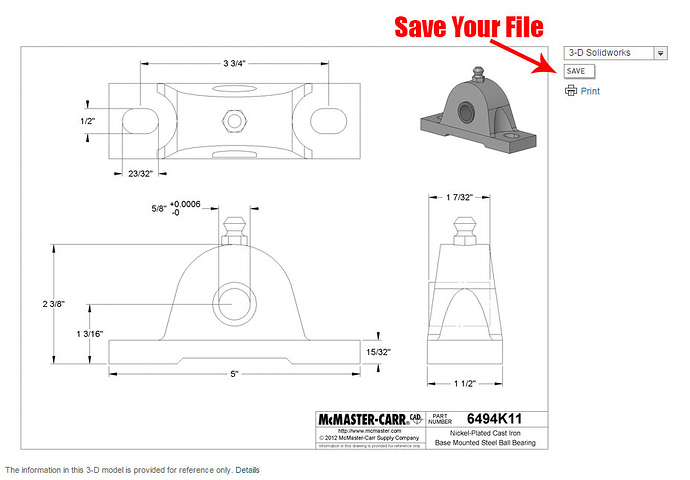 Now that you are ready to actually download the CAD file, click on the part number of the item you want. Then click on the, “Product Detail” button that is shown after clicking your part number. You are now on the product details page. Follow the image below for where to find the “Product Detail” link. Mounted Ball Bearing - Product Detail Page - Above you will notice the, “Product Details”, “Product Drawing” and the “CAD File Save”. Each of these being very beneficial for your design and the CAD file you are about to download. In the top right you’ll want to use the drop down list to select the CAD file type of your choice. For this example I will be using the 3-D Solidworks file type as seen above. Once you have selected the file type you need, click on the, “Save” button and you have the file! Its now ready to be opened up in the CAD software of your choice. If you want to print out the part drawing, just below the “Save” button is the print button for just this! While not every CAD file from McMASTER CARR is of top notch detail they are supposed to be dimensionally accurate. Always verify dimensions before moving ahead though. A new addition in Fusion 360 is the ability to import files from McmasterCarr directly from within Fusion 360. Check out the first minute of this weeks Quick Tip from Autodesk’s Fusion 360 YouTube channel to see how.